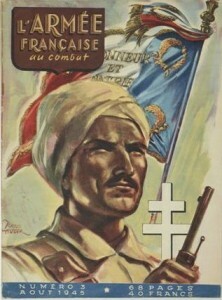 The cover of ‘L’Armée Française au combat’, No. 3, août 1945. Illustration by Raoul Auger. The Friends of Cambridge University Library are hosting a talk by Sir Charles Chadwyck-Healey on the ‘Literature of the Liberation’ in conjunction with the exhibition of the same name which is currently on view in the Milstein Exhibition Centre. The exhibition commemorates the 70th anniversary of the liberation of Paris in 1944 and includes many of the highlights from the Chadwyck-Healey Liberation Collection. In 2001 Sir Charles began collecting books mainly published in France between August 1944 and 1946 that dealt with the Second World War, the German occupation of France and the liberation. The collection reveals how, in the period immediately after the liberation of Paris, French writers and publishers were quick to memorialise recent events. It encompasses everything from comic books and pamphlets to fine press books printed on handmade paper. In 2012 the collection was donated to Cambridge University Library even as it continued to be augmented. The talk starts at 5.30pm on Wednesday 4 June in the Milstein Seminar Room with tea served from 5pm. Non-members are very welcome to attend and admission is free.